Offense: Air Force is the owner of the second ranked rushing attack in the country. They average over 320 yards on the ground per game. Tim Jefferson Jr is the quarterback and his number 1 rushing weapon is Asher Clark. Clark, a senior will most likely leave Air Force as the all time leading rusher. He averages 7.3 yards a rush. Fullback Mike Dewitt is also an important part of the offense. The Falcons won't pass a lot, but when they do, Jefferson will look to WRs Zack Kauth and Jonathan Warzeka. The Toledo defense is vulnerable so look for the Falcons to put up some points. Toledo also boasts a very impressive offense. The Rockets score over 42 points a game. The top playmaker is WR Eric Paige. He has 1123 receiving yards to go with his 10 touchdowns. The Rockets employ a two quarterback system, with both Terrance Owens and Austin Dantin seeing time. The leading rusher is Adonis Thomas, who is very close to reaching the 1000 yard mark and should this game. He is the benneficiary of an experienced offensive line, which bodes well for Toledo. Defense: Air Force has the more impressive of the two defenses, as they give up a not great 27.5 points a game.They have been getting better, however, and are anchored by senior DT Ryan Gardner. LB Brady Amack is the leading tackler and will need to preform well for the Falcons to slow down the potent Toledo offense. FS Jon Davis leads the team with 4 interceptions. Toledo's defense has been the problem for the Rockets this year. They give up over 30 points a game, and don't expect this to change in this game. In games 9 and 10, they gave up 63 points in each game. And they won one. Cornerback Desmond Marrow leads the team in tackles and interceptions, and he will be expected to help stop the run. LB Dan Molls is third on the team in tackles, despite only playing in 6 games this season. The Pick: I like Toledo to win this game. Their offense is too explosive and I feel that the MAC is a stronger league than many give it credit for being. A high scoring game, but the Rockets finally win a close one. If you agree or disagree let me know why by tweeting me @bowlseason or emailing me at ryzim22@yahoo.com . I'll post them if you send them. We picked Toledo. We are now 6-5. Jason Mack, of the Toledo Free Press, answered some questions for us about Toledo football. BS: The Rockets finished 8-4 overall and 7-1 in MAC play. A great season, but they did not advance to the MAC Championship. How would you assess this year overall and in terms of preseason expectations? Jason Mack: The team's main goal was to win the MAC. The regression of the defense down the stretch and the loss to NIU were a disappointment. A bowl win would make this a decent season, but it's certainly short of expectations. BS: Head Coach Tim Beckman has left for the coaching vacancy at Illinois. OC Matt Campbell will be the interim coach. Do you see this having an effect on the team for the bowl game and how would you rate Beckman's overall career at Toledo? Jason Mack: The change should have little effect on the team. The gameplan will be the same and Campbell is a capable game manager. The players all like and respect him. Beckman did a great job turning the talent and attitude of the program around. However, his game management left something to be desired, like the decision not to call timeouts late in the NIU game. His career was too brief to effectively rank. BS: The offense can score points and lots of 'em. They averaged over 42 points a game, led by the rushing of Adonis Thomas and the receiving of Eric Paige. What makes this offense so successful and also please talk about the quarterback situation. Jason Mack: The offense is so successful because of solid starting talent and depth in all facets of the game. It starts with an experienced offensive line. Adonis Thomas has had a tremendous senior season when healthy, but Morgan Williams and David Fluellen are both capable starters. Eric Page is an underrated talent that has a chance to break the NCAA record for career receptions next season. Campbell plans to stick with the rotation between Austin Dantin and Terrance Owens, so expect both to rotate unless one really stands out. BS: The defense has been poor, as it cost the team a chance at a MAC Championship vs Northern Illinois. What has gone wrong with it and who are its key players? Jason Mack: The loss of T.J. Fatinukin was a big reason the defense faltered late in the season. Linebacker Dan Molls and cornerback Desmond Marrow are the two playmakers to keep an eye on. 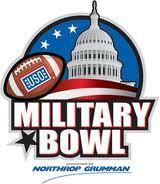 BS: If you could choose one player to have a breakout performance in the bowl game, who would you pick? Jason Mack: With all the attention Eric Page will draw, Bernard Reedy could break free for some deep plays. He's always one of the fastest players on the field. Frank Schwab, of the Colorado Springs Gazette was nice enough to answer some questions for us. BS: The Falcons went 7-5, another solid season, and won the Commander-in-Chief's Trophy for the second consecutive year. How big is it for this football program to win this Trophy for two consecutive years and how would you assess this season overall? Frank Schwab: Winning the Commander-in-Chief's Trophy is a major accomplishment for Air Force - if it's not first on the list of goals, it's near the top. However, it doesn't mean the season wasn't a bit of a disappointment. Air Force won just five games against FBS teams and none had a winning record. The Falcons had a lot of talent returning from a team that beat Georgia Tech in the Independence Bowl, and thought they could compete for a conference title. To finish fifth in the conference was a big surprise. BS: The rushing game, ranked second in the nation, led an offense that scored nearly 35 points a game. Talk about this offense and who are the key guys that will make an impact? Frank Schwab: Asher Clark will probably pass Dee Dowis as the academy's all-time leading rusher, which shows how the offense has changed under Troy Calhoun. Clark was just the third tailback in school history to have a 1,000-yard season, and he's done it twice in a row. The Falcons still use the option attack some, but also prefer a zone-blocking scheme Calhoun learned when he was an assistant with the Denver Broncos. The Falcons still do some traditional option plays, which is why quarterback Tim Jefferson and fullbacks Wes Cobb and Mike DeWitt are important pieces in the running game. BS: The defense had its struggles, but has seemed to solidfy as the season has progressed. Who and what makes this defense successful when it is working? Frank Schwab: The defense had issues in the middle of the season when all three of its starting defensive linemen were out with injuries. A fourth part-time starter joined them on the sideline for a couple games. It is hard to overcome that. I think as the defense got healthy it got a bit better, but the team gave up more than 200 yards to Colorado State running back Chris Nwoke in the regular-season finale. So this is a defense that will give up some rushing yards. The best players for the Falcons might be right up the middle. Nose guard Ryan Gardner is a disruptive presence in the middle. Inside linebacker Brady Amack had more than 100 tackles and seems like a lock to be first-team all-conference. And safety Jon Davis is one of the best defensive backs in the Mountain West. Those players are the keys to the defense. Frank Schwab: I don't know if he's a breakout player, but I think we might see people realize that quarterback Tim Jefferson isn't a typical service academy quarterback. Jefferson can throw the ball well, as well as any quarterback for a service academy in years, and has been in a good rhythm with receiver Zack Kauth lately. Jefferson is a fantastic dual threat, Air Force's all-time leader in wins for a starting quarterback, and I think he'll finish his career with a good bowl performance.